According to the National Fire Protection Association (NFPA), more than 200 home fires each year start with a Christmas tree. 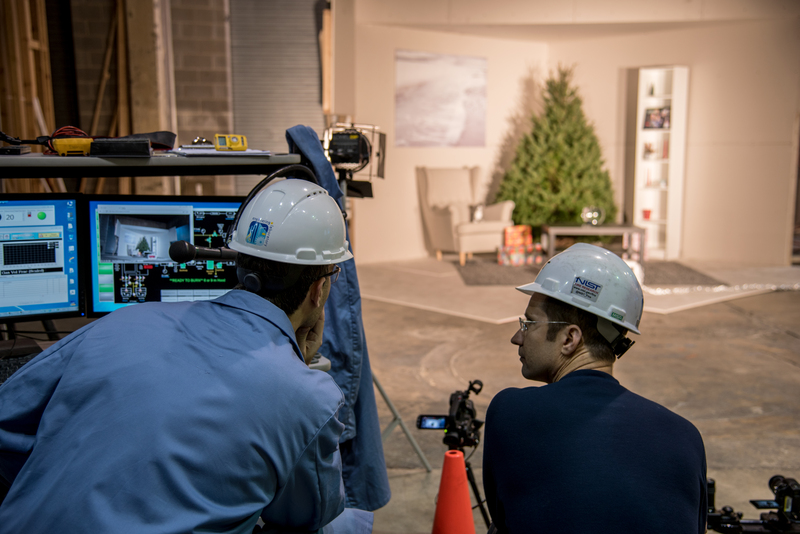 In the videos below, NIST fire researchers demonstrate what could happen if a fire starts in a watered Christmas tree vs. a dry Christmas tree. For Christmas tree safety tips, visit the NFPA website. In this video, NIST fire researchers demonstrate what could happen if a fire starts in a watered Christmas tree vs. a dry Christmas tree. See what can happen if fire starts in a tree that hasn’t been watered. Bundy (left) and research structural engineer Matthew Hoehler (right) look closely to see signs of fire in the watered tree. As expected, the fire set in the well-watered tree didn’t catch. Every holiday season, hundreds of residential fires start with a Christmas tree. Above, you saw the NIST video that illustrates the dramatic difference between a fire started in a well-watered tree versus in a thirsty, neglected tree. Here, you can get a behind-the-scenes glimpse of the video shoot.